ENT ESTRELA POWDERY colors technology is the latest complete collection. 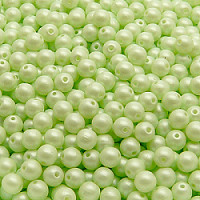 Soft pastel and summer color shades with unconventional powder effect (looking as matte) on the surface of the beads are all covered by this brand. The final appearance and quality of the beads depends not only on the glass that the bead is made from, but also on the surface treatment. The Estrela company developed the ENT technology, which ensures excellent chemical and mechanical resilience. Ultrathin special lacquer layers are thermally fixed to the glass pearls’ surface at 200°C. Chemical bond between the glass and the lacquer sets in during the fixation.